The housing department of consist of three programs that we can assist low-income individuals, senior citizens, and families. Helps to create healthy development in low-income children ages three to five. Programs offer a wide variety of services, that depend on a child's and each family's heritage and experience, to influence all aspects of a child's development and learning. Promotes healthy prenatal outcomes, promotes healthy family functioning, and strengthens the development of infants and toddlers beginning as young as newborn infants. Foster Grandparents giving of their valuable time. Our programs include HEAP and Runaway & Homeless Youth Program. We offer programs to assist with a homeless situation and with family unification. 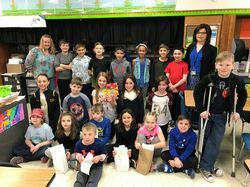 Hart's Hill Elementary School Students Donate! MVCAA received the Walmart Community Playmakers Award which was presented at Sesame Street Live! 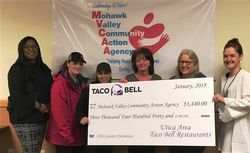 MVCAA's Health & Wellness Fair for Head Start and Early Head Start Families is Thursday, August 30th, 3-6 pm at 9882 River Road, Utica.